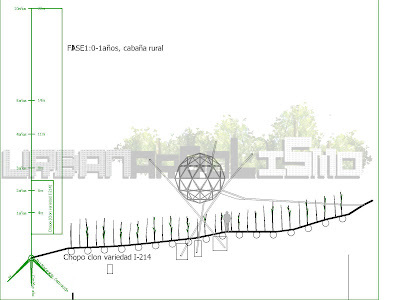 In summary, urbanarbolismo is a response to natural deforestation related to urbanization: "...urbanarbolismo proposed that the reforested area is within the urbanization, so that we do not lose the countryside to urbanize but protect space. We called this concept protected urban nature." One particular project I found quite compelling was the Housing Purification Version 1.0, which envisioned a plant/housing interaction quite unlike any other I've seen. 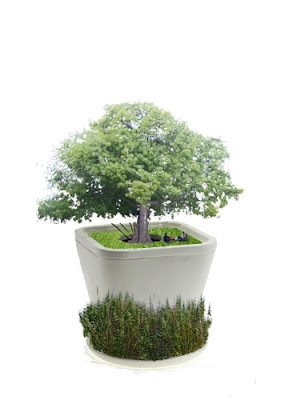 It's akin to living in a giant plant pot, getting the symbiotic benefits from the function of the tree. Some explanation from the site: "Normally the purification systems are processes that are hidden, to make evidentelos instruments of cleansing, the amount of purified water and the goal of using this will be promoting their use and saving water. 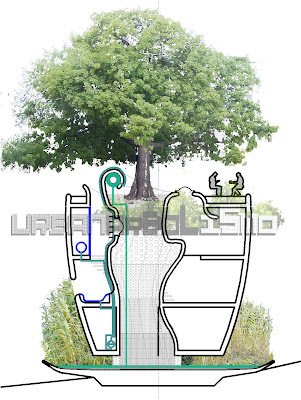 ...The housing plant has a nucleus which is the central structure, the purification system, the heating system thermal inertia and the substrate where it grows a large ficus tree species." Additionally: "The water passes through the strata of the core central arid have different diameters, watering the roots of ficus also filtered water by [root purification]. Once deposited on the glass bottom where the reed ends [continue] purification. It [acts] as sort of the ficus tree because of its ability to handle large amounts of water and capabilities of its aerial roots." 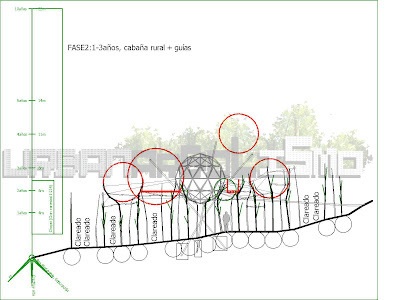 "Phase 1: We planted plants Chopo with a framework for growing 1.5 m. It installs a room "catalyst" that serves as scaffolding to renew planting poplar to the form that will [create] housing. This room can act as rural housing. The shelter forest reforested an area of 200m2 which is the equivalent of the water needs of the forest that can be maintained with the purification of greywater housing." 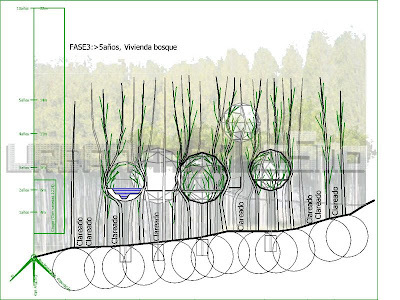 "Phase 2: The scaffold [directs the] growth of poplar plants to generate [the structure] of spaces for future housing." "Phase 3: The trunks and branches of the poplars are the structure and the second closing of the rooms of the house. The climate control of housing depends entirely forest of poplars, which lose their leaves in winter and generate a large area of shade in summer. The housing spaces are spherical because this is the way that interferes less in the development of poplars: aerodynamics, establishing a minimum shadow on the surrounding poplars and does not interfere in the fall of rain." The urbanarbolismo site was mentioned on a great post about AquaURBanism (with a trademark???) on the _urb_ blog - with references to a number of water-related concepts floating around. I have plans to post about a few of these, such as HydroNet and Growing Water - as part of the History Channel City of the Future competition, as well as another for a future Veg.itecture -- the ridiculous and stunning Lilypad by Vincent Callebaut Architecture... which deserves a more expansive look down the line. For now, take the time to sift through the urbanarbolismo site - you won't be disappointed. just wanted to say hi. i love your blog. I'm Jordi from Urbanarbolismo, Thanks for writing about our project and for the definition of vegitecture. We love you blog. Thanks for the comments... and definitely everyone check out jordi's site at Urbanarbolismo - very cool stuff!